Love these and the matching top. Simple without being boring. The bottom is comfortable, a bit cheekier than I'm used to but overall decent coverage. The decorative rings can slide, which I like because you can decide if you want them on the sides, or more in the front. I'm 5'7", 150 lbs, and I opted for the size 8 (tried on that and the 10 - the 10 could have worked too but if I lose weight will be a tad baggy. Ever hopeful...). 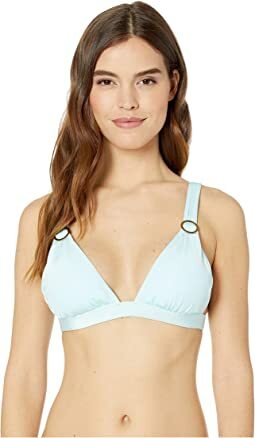 Love this swimsuit - the material feels really good and is very stretchy, so it was easy to get on despite the convertible straps at the back requiring you to figure out which hole your head and arms go into. Once it's on it feels great, and doesn't pull like a halter does (my usual go-to bikini style). Easy to take off too without pulling a shoulder muscle. The decorative rings are really nice, and can slide, so you can move them up or down as you like. I'm 5"7 and 150 lbs. Usually a c-cup bra and I ended up in a 6 (tried on 6 and 8).